The Catholic Church in Canada is part of the worldwide Catholic Church, under the spiritual leadership of the Pope. As of 2011, it has the largest number of adherents to a Christian denomination and a religion in Canada, with 38.7% of Canadians (12.73 million) baptized as Catholics. There are 52 dioceses and about 8,000 priests in Canada. 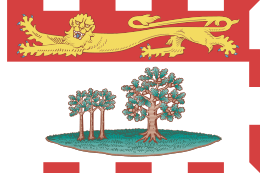 Catholicism arrived in Canada in 1497, when John Cabot landed on Newfoundland, raised the Venetian and Papal banners and claimed the land for his sponsor King Henry VII of England, while recognizing the religious authority of the Roman Catholic Church. A letter of John Day states that Cabot landed on 24 June 1497 and "went ashore with a crucifix and raised banners bearing the arms of the Holy Father". In 1608, Samuel de Champlain founded the first Catholic colony in Quebec City. In 1611, he established a fur trading post on the Island of Montreal, which later became a Catholic colony for trade and missionary activity. 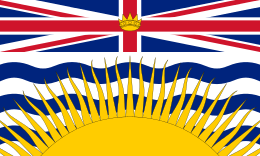 In 1620, George Calvert, 1st Baron Baltimore purchased a tract of land in Newfoundland from Sir William Vaughan and established a colony, calling it Avalon, after the legendary spot where Christianity was introduced to Britain. In 1627 Calvert brought two Roman Catholic priests to Avalon. This was the first continuous Roman Catholic ministry in British North America. Despite the severe religious conflicts of the period, Calvert secured the right of Catholics to practice their religion unimpeded in Newfoundland, and embraced the novel principle of religious tolerance, which he wrote into the Charter of Avalon and the later Charter of Maryland. The Colony of Avalon was thus the first North American jurisdiction to practice religious tolerance. Fears of the Catholic Church were quite strong in the 19th century, especially among Presbyterian and other Protestant Irish immigrants across Canada. In 1853, the Gavazzi Riots left 10 dead in Quebec in the wake of Catholic Irish protest against anti-Catholic speeches by ex-monk Alessandro Gavazzi. The major flashpoint was public support for Catholic French language schools. 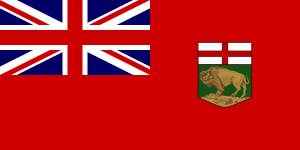 Although the Confederation Agreement of 1867 guaranteed the status of Catholic schools where they had been legalized, disputes erupted in numerous provinces, especially in the Manitoba Schools Question in the 1890s and Ontario in the 1910s. In Ontario, Regulation 17 was a regulation by the Ontario Ministry of Education, that restricted the use of French as a language of instruction to the first two years of schooling. French Canada reacted vehemently, and lost, dooming its French language Catholic schools. This became a central reason why French Canada distanced itself from the war effort, as its young men refused to enlist. 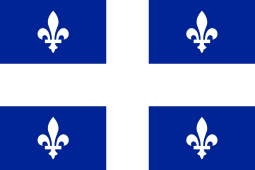 The central theme of Catholic history from the 1840s through the 1920s was the contest for control of the church between the French, based in Quebec, and the English-speaking Irish (along with smaller numbers of Catholic Scots and others) based in Ontario. The French Catholics saw Catholics in general as God's chosen people (versus Protestants) and the French as more truly Catholic than any other ethnic group. The fact that the Irish Catholics formed coalition with the anti-French Protestants further infuriated the French. The Irish Catholics collaborated with Protestants inside Canada, on the school issue: they opposed French language Catholic schools. The Irish had a significant advantage since they were favoured by the Vatican. Irish Catholicism was "ultramontane", which meant its adherents professed total obedience to the Pope. By contrast, the French bishops in Canada kept their distance from the Vatican. In the form of Regulation 17 this became the central issue that finally alienated the French in Quebec from the Canadian Anglophone establishment during the First World War. Ontario's Catholics were led by the Irish Bishop Fallon, who united with the Protestants in opposing French schools. Regulation 17 was repealed in 1927. The French-speakers remain more liberal than the English-speakers to this day, and in addition are also leaving the faith much more quickly. One by one, the Irish took control of the church in each province except for Quebec. Tensions were especially high in Manitoba at the end of the 19th century. In Alberta in the 1920s, a new Irish bishop undermined French language Catholic schooling, and removed the Francophile order of teaching sisters. In the Dominion of Newfoundland (which was an independent dominion before joining Canada in 1949), politics was polarized around religious lines, with the Protestants confronting the Irish Catholics. In 1861, the Protestant governor dismissed the Catholic Liberals from office and the ensuing election was marked by riot and disorder with both the Anglican bishop Edward Feild and Catholic bishop John Thomas Mullock taking partisan stances. The Protestants narrowly elected Hugh Hoyles as the Conservative Prime Minister. Hoyles suddenly reversed his long record of militant Protestant activism and worked to defuse tensions. He shared patronage and power with the Catholics; all jobs and patronage were split between the various religious bodies on a per capita basis. This 'denominational compromise' was further extended to education when all religious schools were put on the basis which the Catholics had enjoyed since the 1840s. Alone in North America, Newfoundland had a state funded system of denominational schools. The compromise worked and politics ceased to be about religion and became concerned with purely political and economic issues. The Roman Catholic population in Canada in 2001 and 2011. The Catholic population underwent its first recorded drop between 2001 and 2011. Notable trends include the de-Catholicization of Quebec, a drop in the Catholic population in small provinces with stagnant populations, and a rise in Catholics in the large English-speaking provinces of Ontario, British Columbia, and Alberta. Immigration has not helped prevent the decline in the Catholic population; the only major source of Catholic immigrants to Canada is the Philippines. In addition, there are also adherents of Eastern Catholic Churches who had already migrated to Canada. 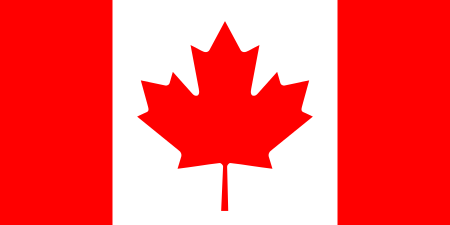 There is a Military Ordinariate of Canada for Canadian military personnel. The Anglican use of the Latin Church is served from the United States, based in Houston, Texas, by the Personal Ordinariate of the Chair of Saint Peter. 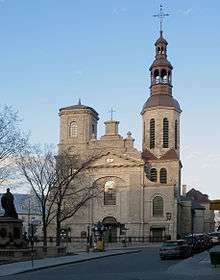 One former Canadian bishopric, the francophone Roman Catholic Diocese of Gravelbourg in Saskatchewan, has since its suppression in 1998 become a titular episcopal see, which may be bestowed on any Latin bishop without proper diocese, working in the Roman Curia or anywhere in the world. Ukrainian Catholic Eparchy of Toronto and Eastern Canada in Toronto. Huel, Raymond. Archbishop A-A Tache of St. Boniface: The “Good Fight” and the Illusive Vision (University of Alberta Press, 2003). ↑ "George Calvert and Cecilius Calvert: Barons Baltimore of Baltimore". New York: Dodd, Mead, and Company. Retrieved 2013-01-23. ↑ "Sir George Calvert and the Colony of Avalon". heritage.nf.ca. Retrieved 2013-01-23. ↑ Dan Horner, "Contesting Authority in the Aftermath of Montreal's Gavazzi Riot." Histoire sociale/social history 44.1 (2011): 29-52. ↑ Margaret Prang, "Clerics, Politicians, and the Bilingual Schools Issue in Ontario, 1910–1917." Canadian Historical Review 41.4 (1960): 281-307. ↑ Jack Cecillon, "Turbulent Times in the Diocese of London: Bishop Fallon and the French-Language Controversy, 1910–18". Ontario History (1995) 87#4 pp: 369–395. ↑ Gordon L. Heath (2014). Canadian Churches and the First World War. Wipf and Stock Publishers. pp. 82–83. ↑ Robert Choquette, Language and religion: a history of English-French conflict in Ontario (Univ of Ottawa Press, 1975). ↑ Cecillon, Jack (December 1995). "Turbulent Times in the Diocese of London: Bishop Fallon and the French-Language Controversy, 1910–18". Ontario History. 87 (4): 369–395. ↑ Barber, Marilyn (September 1966). "The Ontario Bilingual Schools Issue: Sources of Conflict". Canadian Historical Review. 47 (3): 227–248. doi:10.3138/chr-047-03-02. ↑ John P. Greene (2001). Between Damnation and Starvation: Priests and Merchants in Newfoundland Politics, 1745-1855. McGill-Queen's Press. pp. 236–38. ↑ Frederick Jones, “HOYLES, Sir HUGH WILLIAM,” in Dictionary of Canadian Biography vol. 11, University of Toronto/Université Laval, 2003–, accessed May 25, 2015, http://www.biographi.ca/en/bio/hoyles_hugh_william_11E.html. ↑ Statistics Canada (2001). "Population by religion, by province and territory (2001 Census)". ↑ Statistics Canada (2011). "2011 National Household Survey: Data tables". 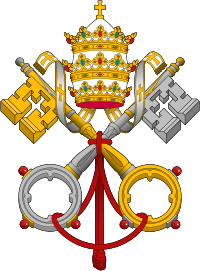 Wikimedia Commons has media related to Catholic Church in Canada.